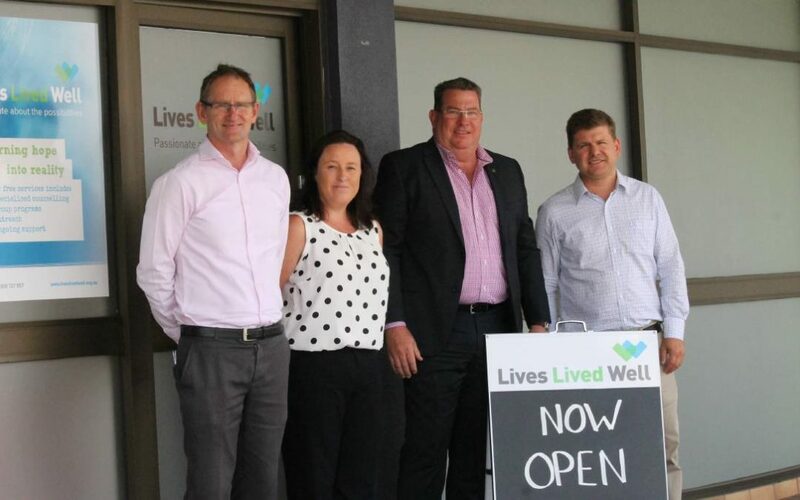 Lives Lived Well’s official opening of a new space in Beaudesert will allow for an increase in drug and alcohol support to the community, including the running of group programs. Moving into a new and larger space, the Lives Lived Well team will be able to increase their counselling support in the area and be able to offer group work through the Smart Recovery program as well as family information sessions through the Breakthrough for Family program. Speaking at the opening, Federal Member for Wright, Scott Buchholz MP said Lives Lived Well provided essential community support for those impacted by drugs, alcohol and mental health issues. “Lives Lived Well provides a respected and essential service for our community here in Beaudesert and across the Scenic Rim,” Mr Buchholz said. Also welcoming the launch, Jon Krause, State Member for Scenic Rim, said that the Lives Lived Well team would help cover a missing link in social services for the Beaudesert district by providing much needed support for the wellbeing of those whose lives have been affected by substance use. “The Scenic Rim Electorate needs its fair share of services and the opening of a new, larger space for Lives Lived Well shows the need and support that networks like this have in our community,” Mr Krause said. Lucille Chalmers, Brisbane South PHN’s General Manager of Commissioned Programs, said evidence shows access to specialist alcohol and drug (AOD) treatment plus improved coordination of care and increased early intervention delivers positive impacts not only for the individual, but for the community and the broader health system. “Brisbane South PHN recognises the challenges faced by individuals experiencing harm from problematic substance use, and the people who support them. Beaudesert is one of our priority locations, as identified in our 2018 Needs Assessment, so we are very pleased to be able to support extending services in the region,” she said. For media inquiries, call Lives Lived Well Marketing and Communications Team Leader, Michelle Saftich on 0407 074 645.